Want to connect with Martin? Been painting and repairing houses in the Atlanta area for last 20yr. 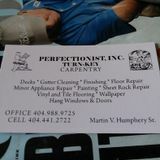 Call me at 404-441-... . Get your home done the way you have dreamed about.. I may not be the best, but I am one of them. O&C Painting profesional painters with more of 18 years of experience in Residential,commercial, Interior and exterior.